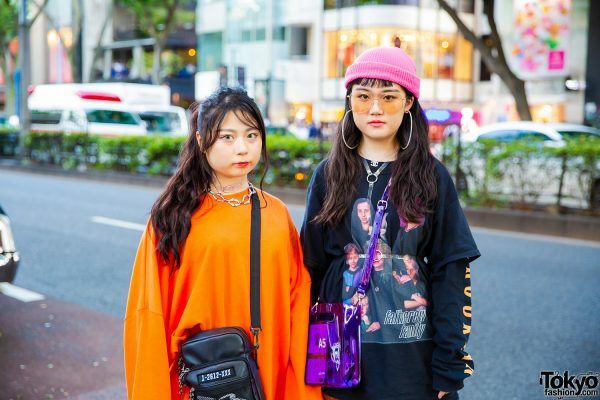 Meet Pinapoco and 8ight7even, two teenage girls whose orange-hued streetwear styles immediately caught our eye on the Harajuku street. 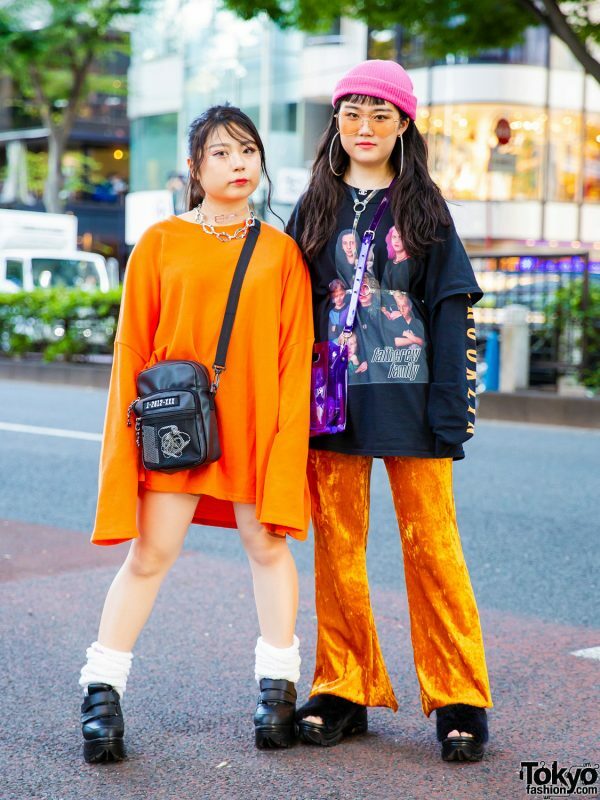 At the left is Pinapoco, who is dressed in an orange asymmetrical hem sweatshirt dress with extra long sleeves from Barcode (could be DrinkScanCode), which she styled with white Barbie ribbed socks and black platform velcro-strap shoes from Dolls Kill. 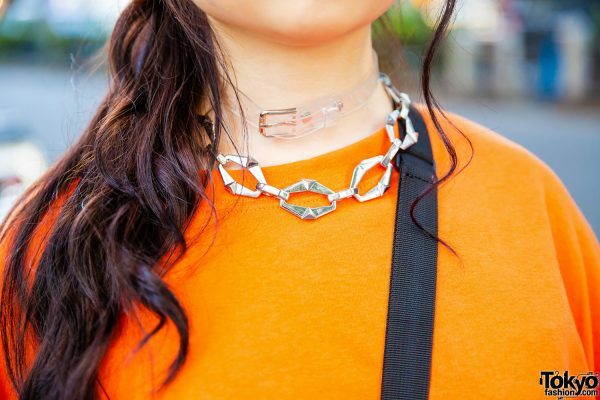 The 16-year-old student accessorized her look with a clear belt choker layered with a chunky chain necklace from Whoop’EE’ and a black crossbody bag with mesh pockets from WEGO. Pinapoco’s fashion favorites are One Spo and Fig & Viper, and she loves the music of Ariana Grande. 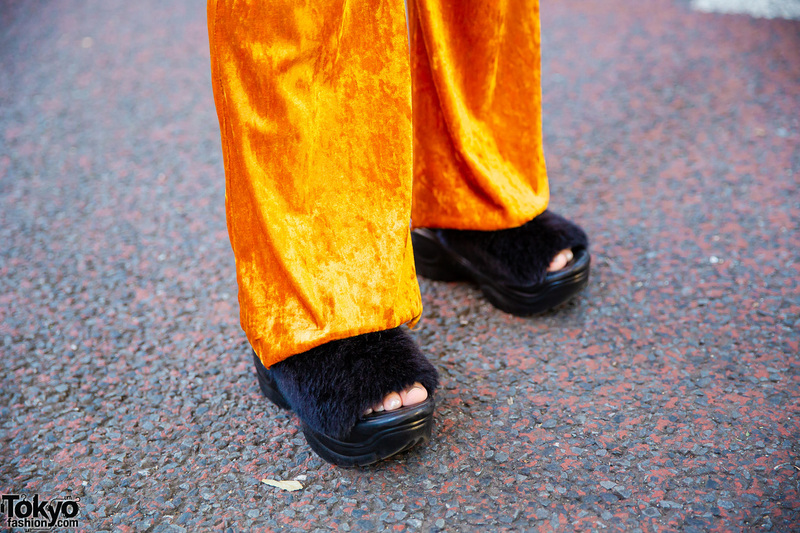 Follow Pinapoco on Instagram. 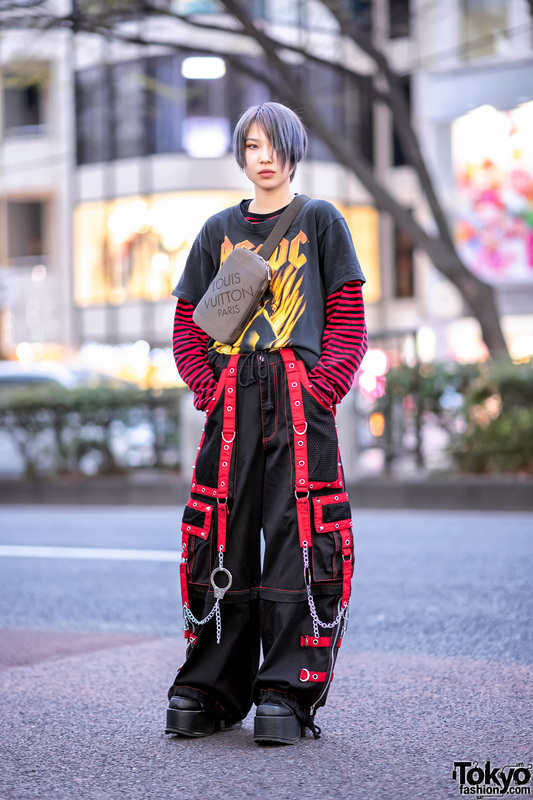 Meanwhile, 8ight7even stepped out in a black Faith Crew Family t-shirt over a black sweatshirt with sleeve prints, from Faith Tokyo and Warp. 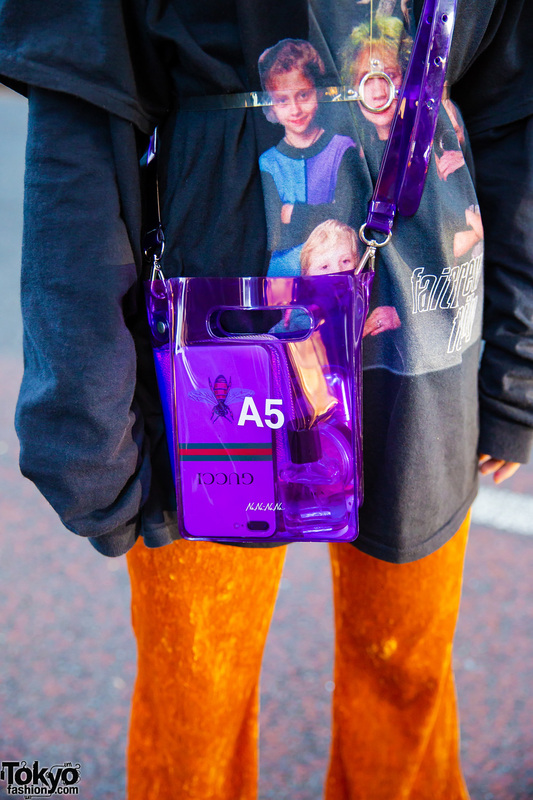 She styled her layered tops with orange velvet pants from Forever21, slipped into black fuzzy platforms from Spinns, and carried a purple see-through sling bag from NaNa-NaNa. 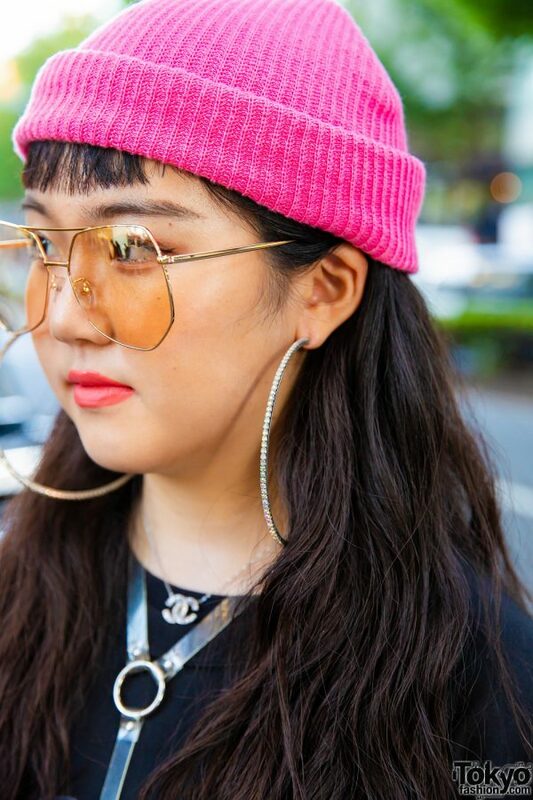 Her accessories – from Forever21 and Pinnap – include a pink ribbed beanie, oversized sunglasses, a Chanel logo pendant necklace, a clear o-ring body harness and a pair of oversized hoop earrings. The 17-year-old student loves to shop at Faith Tokyo, and she likes the music of Nicki Minaj and Cardi B. 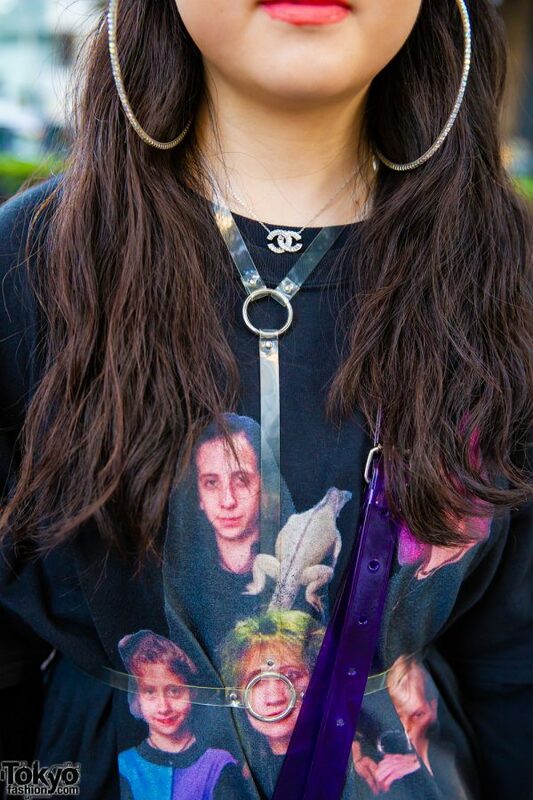 Follow her on Instagram and Twitter.